Yes….it is possible, and I’m not talking about VOIP. If you have an iPod touch, don’t have a phone, don’t want to buy a phone or want to make calls from your iPod Touch then Yosion’s Apple Peel 520 is the product (not software) for you. The apple peel is kind of like a case which transforms your iPod into a nearly functional iPhone. 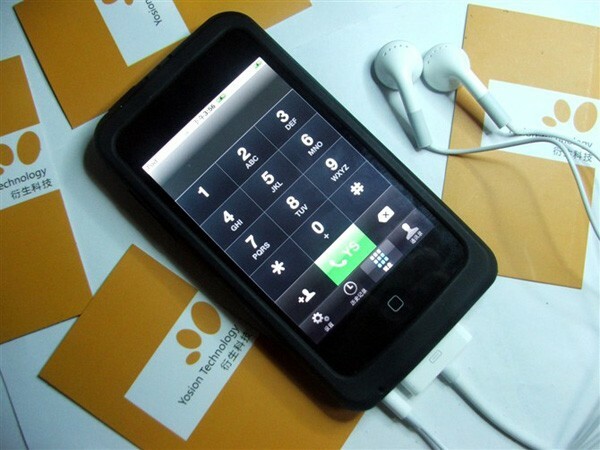 It contains a battery, dock connector and SIM card reader that enables voice calls. But don’t get too happy because it has its flaws. Incoming phone numbers don’t appear most of the time, ringtones cannot be customized, incoming calls do not light up the iPod touch display and one of it’s major problems is that you can’t send a message to multiple recipients. Another problem not relating to it’s performance is that it makes your slim iPod touch much more fat. Maybe even a little fatter than a 2nd Gen iPhone. Now let’s see the other side of the coin, what can it do…It does everything it advertises very well. You can make/receive calls, send/receive messages but only to one recipient at a time and it also extends your battery life so you get 4more hours of calling and 120 hours of standby time more. But the catch is, that you have to jailbreak your iPod for it, this is not actually a ‘catch’ any more because now jailbreaking is legal but we will have to wait some time for the new iPod touch (4th gen with the camera and Retina Display) to get compatibility because it can’t be jailbroken right now. After you jailbreak your iPod you can install the Call and Messaging apps on your iPod. See here for Why you should jailbreak your iPod Touch/iPhone/iPad and how to jailbreak your iPod Touch/iPhone/iPad. The Apple Peel is expected to release in the US in the first week of October for $57 ( which is pretty cheap for all its features). So, if you don’t mind all its flaws and just care about making calls from your iPod then $57 is a good price to pay. I think m.i.c gadget is a better place to buy this. It sells it for $99. If you have a Symbian 60v5 phone with wifi, you could use joikuspot to use 3G. Personally, I think this case is just a waste of money. Don't flame me, everyone's entitled to an opinion. The Apple Peel 520, a Chinese-developed product is able to turn an iPod Touch into an iPhone-like device. The Apple Peel is a protective case equipped with a dock connector, battery and SIM card, that slips on to an iPod Touch. Apple peel is a amazing product specialise in fitting for iPod Touch, which can esaily change iPod Touch into iphone cell phone. – Call any number in India for free for a few minutes for trial. If you like it, purchase talktime / get talktime by adding sponsored apps. but that would only work with wi-fi right?